Back in March I received an email from a sharp-eyed fellow-spinner who had purchased a wheel that was sold as by Joe Gibson of Wellington. 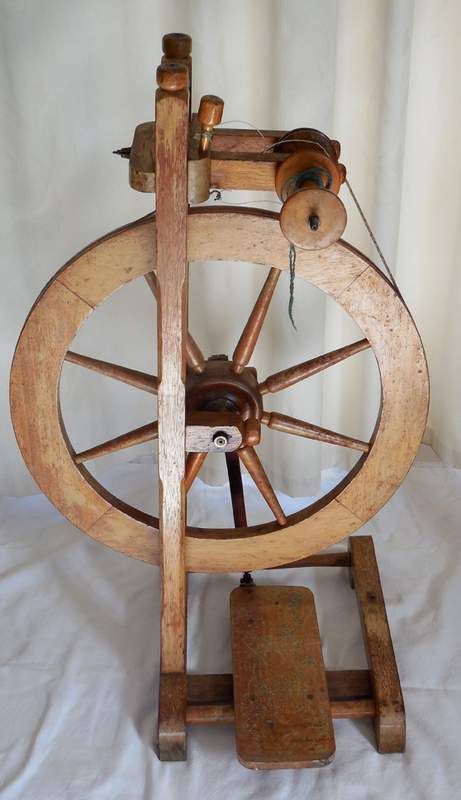 She browsed on www.nzspinningwheels.info, and thought it was by Gib Wilson of Invercargill. After studying her photos I agreed. 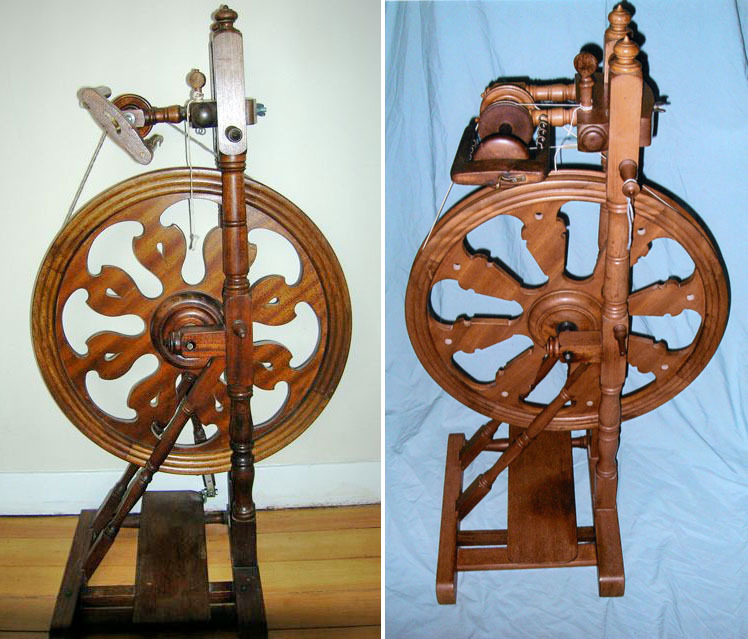 Here are a wheel known to be by Wilson (left) and Sonya’s wheel (right). Sonya’s wheel is basically a mirror image of the Wilson. It doesn’t look exactly like any of his other wheels we’ve seen, but it has features that are typical of him and of no other maker I know of. This jogged my memory: a neglected-looking wheel with no flyer had recently come to our Guild and been rejected as useless. In fact it was consigned to become an ornament in a member’s garden. Now I began to think I had made a terrible mistake in letting it go. Fortunately I was able to intercept it, with many apologies to the deprived gardener, before it ended up outside. Yes, another Gib Wilson wheel! This is exciting, because I’ve long wished I knew more about him and his wheels. So far we know little about his life, except that his occupation before retirement was ‘wood machinist’. But we do know he loved making spinning wheels. I have a copy of a very touching letter dating from 2006 when Lyndsay Fenwick and I were first trying to find out about New Zealand wheels. The writer (signature illegible, perhaps Pamela) describes how Gib made her a wheel to her specifications using wood from her own property. This was my wheel before any cleaning or restoration. The diagonal strut is broken off, there’s no flyer and if you look hard, you may notice a bird dropping. Wilson also made a few wheels that are more elaborate, and very beautiful. I know of three; here are two of them. They are excellent spinners and their owners love them. As well as the cutout design of the drive wheel, they have two struts steadying the support posts instead of just one, an unusual and lovely hook-orifice (click to enlarge the photos and see it little better) and generally fancier turning. Wilson’s wheels share a unique system for adjusting the drive band tension. 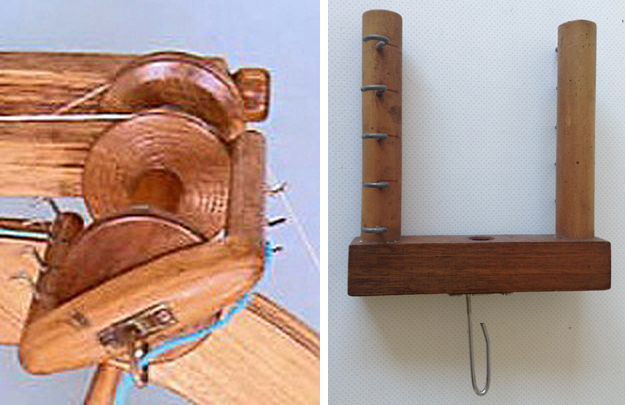 When the wing nut (on mine, left) or the knob (on Sonya’s, right) is loosened, the two horizontals can slide up and down the support posts, moving the whorl, spindle and flyer up or down. When it’s removed completely, you can disassemble the mechanism (but it’s necessary to cut the drive band to separate everything). However, Sonya’s works a little differently from the (admittedly few) others I’ve seen. 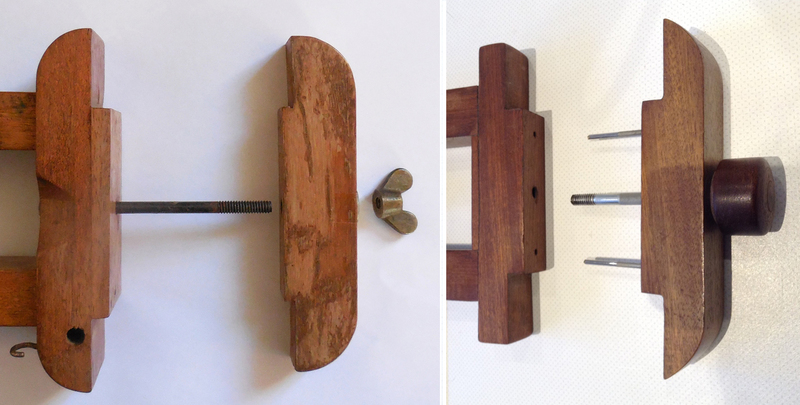 The knob is the head of a screw, and there are two metal guides to keep the crosspiece level. There are several other differences between the two wheels. For example the axle of mine is firmly sealed into the hub, and probably has needle roller bearings like those Mike Keeves found in the spindle assembly when he was making me a new flyer. Sonya’s wheel has the hub secured to the axle by a metal pin, somewhat like those on earlier Ashford Traditionals except that the pin goes right through the hub and sticks out on the other side. Moreover the axle on my wheel ends in a visible bearing on the spinner’s side, whereas Sonya’s is concealed in the support. Then there are the conrods (footmen) and their connections. Mine has a complicated connection involving unsealed ballbearings where it joins the crank. These may need replacing at some point – one of the little balls is already missing. 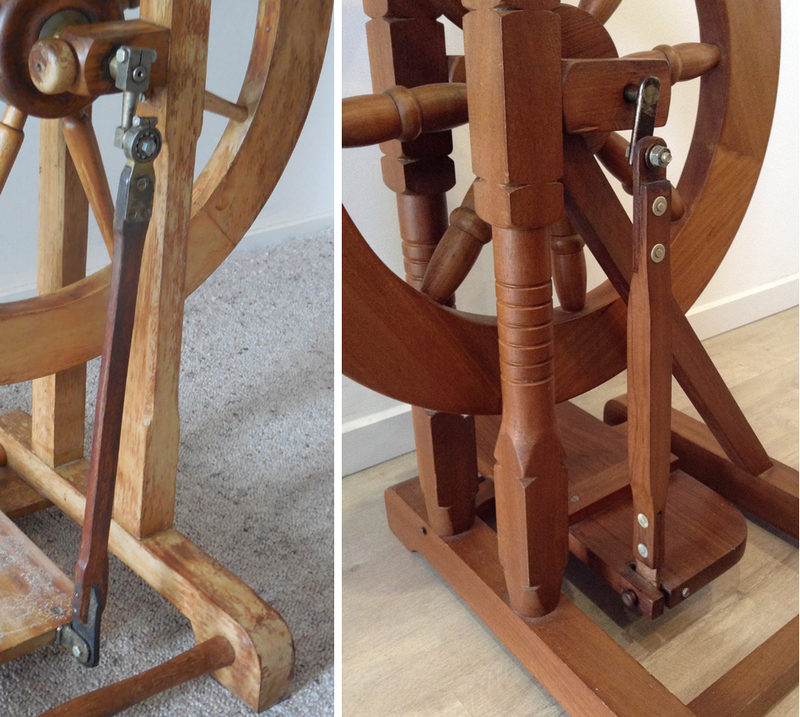 It connects to the treadle via a piece of leather and a metal fitting very securely attached to the treadle. The top of Sonya’s conrod has leather fastened to the crank with a simple nut/bolt/washer. 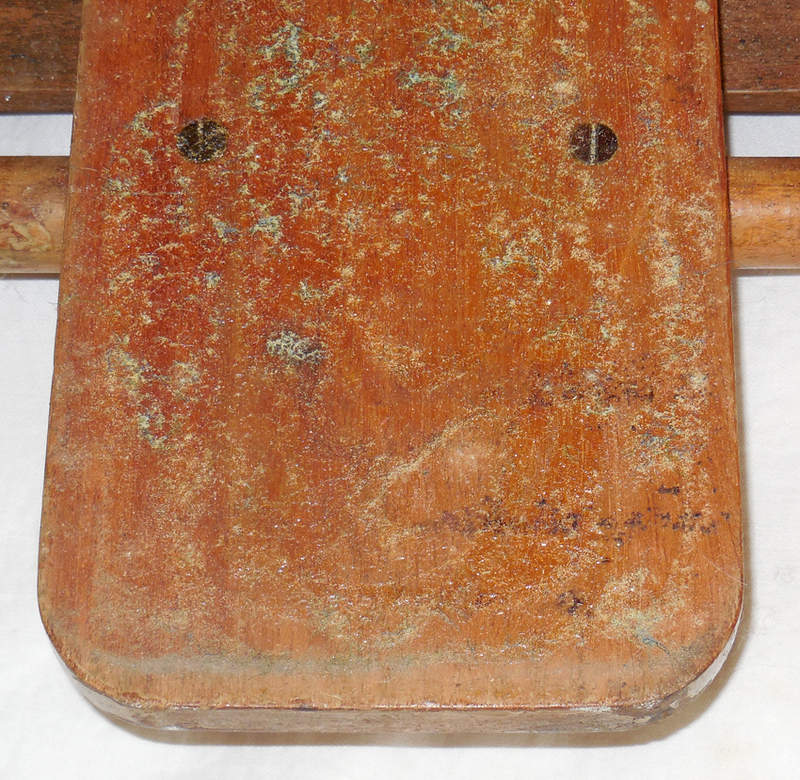 The bottom has a piece of leather slotted into conrod and treadle, almost exactly like an early Traddy. The flyers obviously vary. I think we can assume that my wheel had a flyer like the identical complete Wilson wheel, whose flyer is shown below left. Sonya’s flyer is so different that we have wondered whether it is a replacement. It would be stronger than the usual Wilson flyers, which (as Mike Keeves pointed out) don’t have a lot of wood at the ends of the crosspiece to secure the arms in, and it would certainly be simpler to make. The hook is very different too. A significant difference is in the whorls: Sonya is fortunate to have three ratios (6:1, 8:1 and 12:1) whereas I have only one (8.5:1). 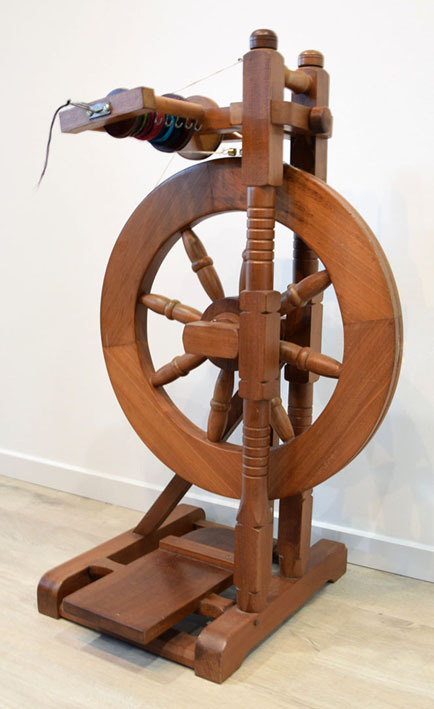 A further refinement of Sonya’s wheel is that the little knob on top of the front post turns to adjust the bobbin brake. Mine, shown below left wearing its handsome new flyer, has a rather awkwardly placed peg for the purpose, and the knobs on both posts are purely decorative. The contrast in the finish and detailing of the wheels (I’m beginning to want to call them earlier and later) is very noticeable. Sonya’s has more elaborate and crisper turnings. 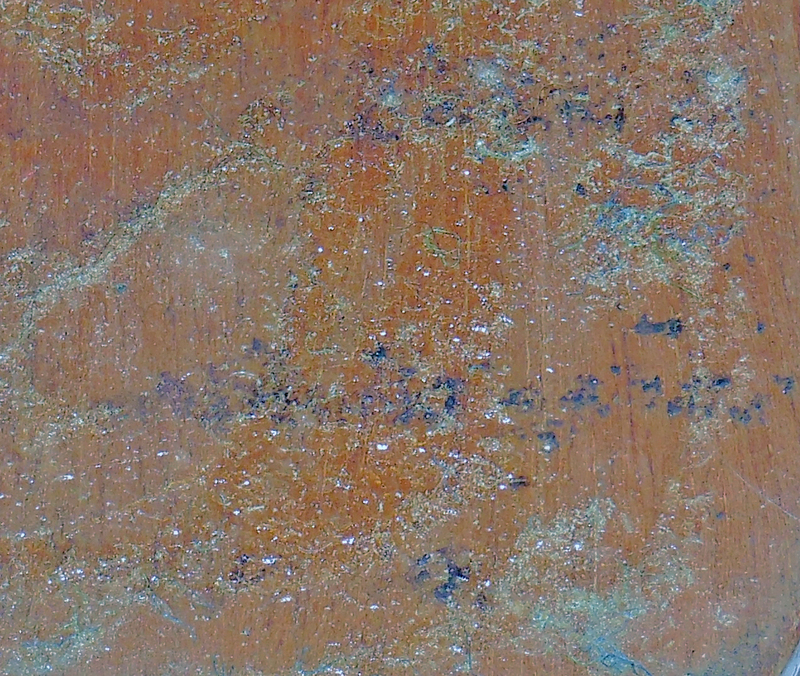 The edges are sharper and the surfaces smoother. Perhaps this could be partly due to using different wood. The complete wheel we saw above is made of White Meranti from Malaya, and I think mine is too. We think Sonya’s wheel is made of Southern Beech (nothofagus spp) which may be easier to work. In general it looks as though Wilson may have refined his style, while at the same time simplifying some details of construction, particularly around the hub and the conrod. 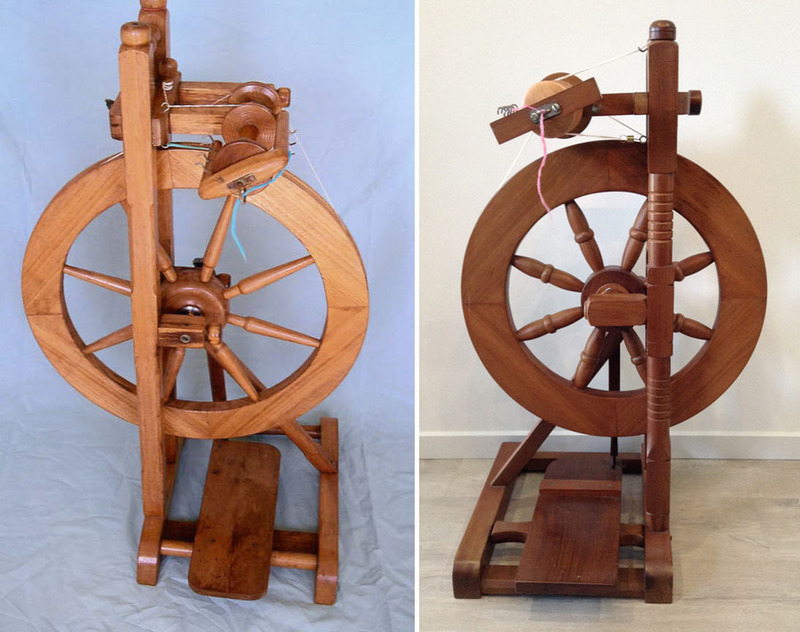 It’s tempting to think that towards the end of his life he saw more spinning wheels by other makers, including Ashford whose Traditional hit the market in 1965. ‘I love the “look” of my wheel. I really like the simplicity it has. Having the upright post knob as the bobbin brake knob and no table contributes to this. The turnings are very precise without being fussy, and the compact size is perfect for my apartment. My wheel is not quite ready for serious spinning yet, as it wobbles badly without its diagonal strut. Once this is replaced I believe it will spin well too, though perhaps with some signs of age. It has had a hard life, but the moderate mount of noise it makes may quieten with more oiling and spinning. I like to imagine the word near the centre could be Wilson … but it’s just as likely that there were some carpet maker’s markings on the back of the tile that got transferred to the wood. Whether it will be possible to remove the worst of the glue without removing all the writing remains to be seen. Sonya and I would both love to learn more about Gib Wilson and his wheels. If you have one, or can tell us anything further about him, do please get in touch. I thank Sonya for her generous help with details and photos, and Mike Keeves for helpful advice and creating a flyer and bobbins that work and look at home on my wheel. This entry was posted in Uncategorized and tagged Gib Wilson, James Wilson on June 16, 2018 by maryinnz.